The image was striking. A black man with his fists raised in the air, his arms crossed like an X. It was even more striking given that this man was standing on the medal stand at the Rio Olympics and not on an American street corner protesting in the name of Black Lives Matter. It was a protest for black lives nonetheless, those about 6,000 miles away in Ethiopia. 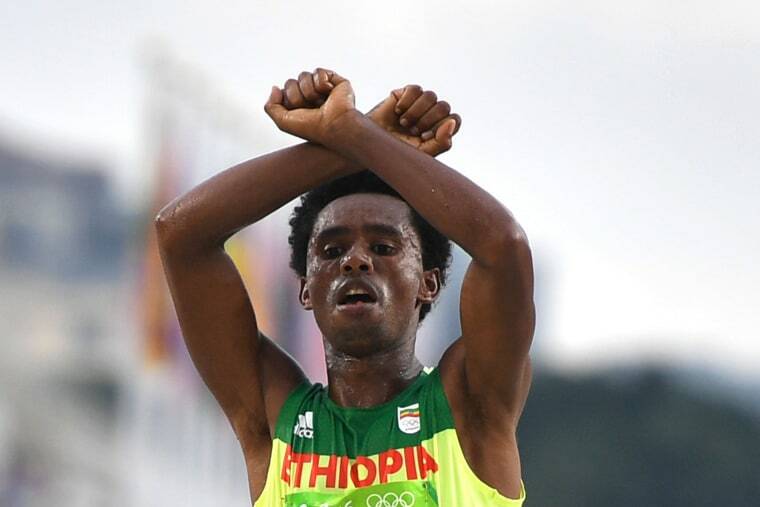 Lilesa, a member of the Oromo tribe, said he threw up the “X” in protest of Ethiopia’s government and in solidarity with his persecuted tribesmen. The Oromo is the country’s largest tribe, but also among its most marginalized. For his act Lilesa said he’d likely be punished by his government. "They will kill me," Lilesa said. "If not, they will [arrest and] charge me." Lilesa's symbolic protest, which he raised when crossing the finish line and again on the podium, comes decades after other black athletes protested treatment of their own people. None were killed, but they suffered great losses nonetheless. During the 1968 Olympics in Mexico City, two American sprinters named Tommie Smith and John Carlos won the gold and bronze medals in the 200-meter dash, with Smith setting a World and Olympic record on the way to victory. But it was what they did after that won the hearts of some and the scorn of others. The two black men took to the podium as the Star Spangled Banner played, wearing black socks and no shoes. Their heads were bowed low and each raised a gloved fist. The shoeless feet represented African Americans in poverty, and the black fist was a symbol of black power and unity, a call for radical change in the way the American government treated black people. Smith wore a scarf. Carlos wore beads. Both were worn in memory of lynching victims in the United States. It was the height of protests and the black power movement which fought to end systemic racism and violence perpetrated by various arms of the government, including the police and the long arm of Jim Crow segregation. It was a tumultuous year stateside. The country was torn over the Vietnam War. Dr. Martin Luther King Jr. and Robert F. Kennedy had both been assassinated. And the world watched as police beat and brutalized protesters at the Democratic National Convention in Chicago. All of those events came before that dramatic moment with those two black men on the podium in Mexico City. In fact, Carlos and Smith were among a group of athletes who discussed boycotting the games over racial inequities in the United States. Their protests on the podium that day in Mexico City were not spontaneous acts of consciousness. The two were among a growing group of black athletes at the time who used their athletic prowess and notoriety to bring attention to the concerns over the civil rights of African Americans. The group included Muhammad Ali, Jim Brown, Bill Russell and Kareem Abdul-Jabbar (then Lew Alcindor). Carlos and Smith were joined by other black athletes who staged various forms of protest at the games. Following their silent protest, the full wrath of the United States and the Olympic Committee fell on Carlos’ and Smith’s shoulders. The men were stripped of their medals, kicked out of the Olympic Village and forced off the U.S. team. Famed sports broadcaster Brent Musberger, then a columnist for the Chicago American, infamously called the pair “black-skinned storm troopers.” There were death threats. They struggled to find gainful employment. With time the legacy of the men has shifted in popular culture and the history of the civil rights era. Their lives seemed to have ebbed and flowed, from public derision to the polish of time. The image of Smith and Carlos on the medal stand has become iconic, a powerful image of black activism that has gone on to hang on generations of bedroom and dorm room walls, an inspiration that generations ago had been as incendiary an act against the public image of the American government on the international stage as there could’ve been. San Jose State University, where the men were students at the time of their protest, even erected a statute, 20-feet high, dedicated to the duo. It shows the men as they are mostly remembered, with their fists held high. As for Feyisa Lilesa, the Ethiopian compatriot of Smith and Carlos in the spirit of Olympic protest, it’s yet to be seen what he’ll face at home. The fireworks and buzz surrounding the Rio games are just now beginning to dim, the dew of competition still moist on the fields of competition. Lilesa, the father of two, said his life will likely be under threat back home and that if need be he’d apply for political asylum in the United States. "Oromo is my tribe," he told reporters. "My relatives are in prison, and if they talk about democratic rights, they are killed." “I can assure you nothing is going to happen to his family; nothing is going to happen to him,” Reda said.